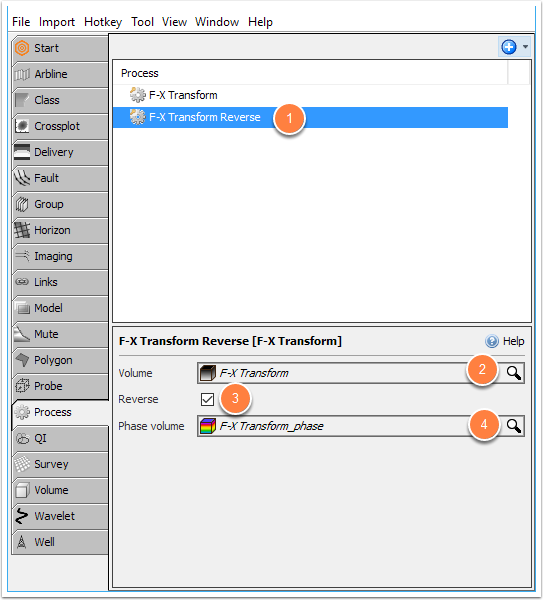 Description F-X transform converts a volume to frequency and phase domains. 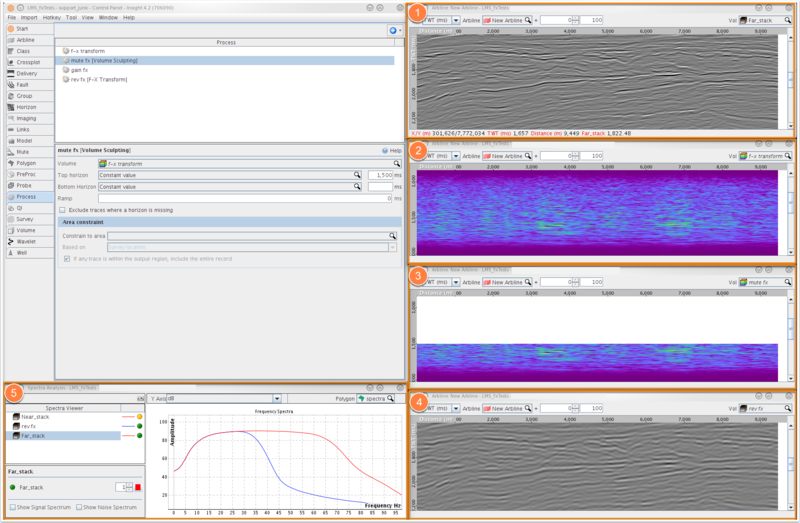 F-X transform converts a volume to frequency and phase domains. Although the results are displayed in "TWT", the vertical domain is frequency or phase depending on the selected output volume. Once converted, additional processes can be applied to achieve different results (interpolate, mute, gain). Go to the Process tab, click the "+" button and search for F-X Transform. Click and provide a name for the transform process. Select your input volume from the Volume search box. To reverse the F-X transform process and reconstruct a TWT volume. 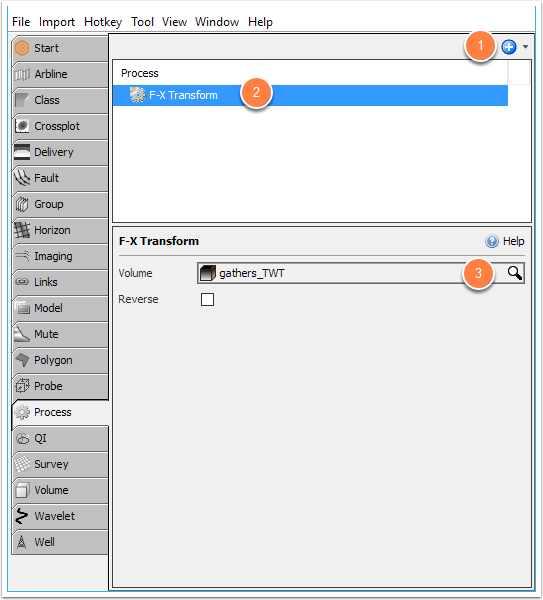 Create an F-X Transform process. For Volume, select the F-X frequency volume. For Phase volume, select the F-X phase volume. One volume is created in the Volume Tab. The F-X transform frequency volume. 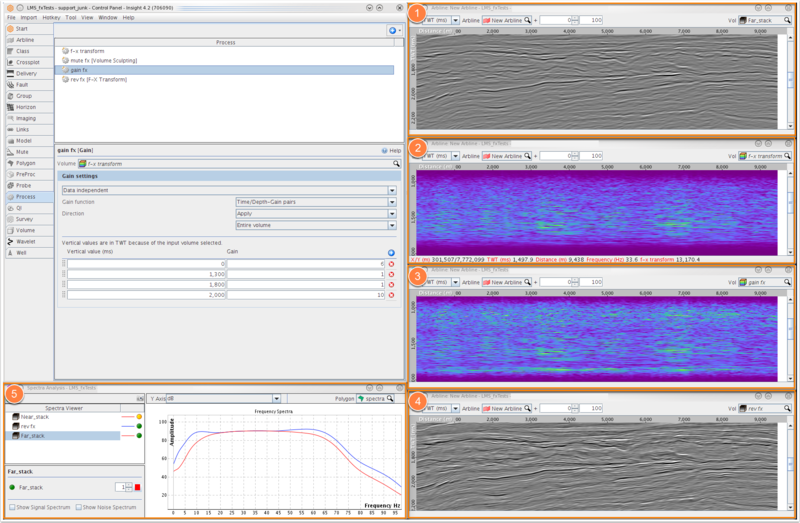 A volume sculpt process is applied to the F-X frequency volume. The settings are shown on the left. A reverse F-X transform is applied to the sculpted frequency volume generating the output stack. The Spectra Analyser shows a comparison between the original stack (red) and the output result (blue). A gain process (time / gain pairs) is applied to the F-X frequency volume. The settings are shown on the left. A reverse F-X transform is applied to the gained frequency volume generating the output stack.